The Hot Cocoa Crawl is back for its second year! 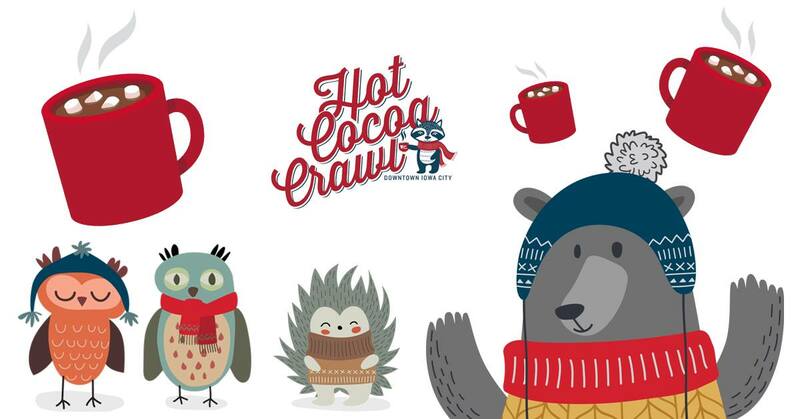 After selling out last year, the Iowa City Downtown District and your favorite businesses have decided to bring you the Downtown Hot Cocoa Crawl for those who love shopping, tasty drinks, and exclusive deals. Join us for an evening of hot cocoa, hot toddies and other fun winter drinks, appetizers, and delightful sales from our wonderful downtown businesses on Friday, January 18th from 5:00 – 8:00pm. A ticket purchase will include a customized hot cocoa mug, a small gift, an ICDD tote bag, and access to the sales and drinks (both alcoholic and non-alcoholic will be available) at each participating shop. This event is for all ages. If you are under 21, you will still receive a customized glass and there will be non-alcoholic beverages for you to enjoy, such as regular hot cocoa, apple cider and more! Tickets are $15.00 and are limited to only 250 tickets! Online ticket sales will end at noon on January 18th. *Please note: This is a rain or shine event. There will be no ticket refunds.